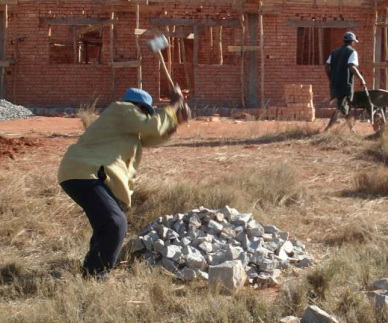 The first job is to break chunks of rock off boulders in the hills and bring them down to the building site by oxcart. The rock is then used to make the foundation and broken into gravel for cement. Almost all building materials are harvested nearby: the sand and water are brought from the nearby stream and mixed with shovels. Only the bags of cement, wood and tin for the roof, and nails are purchased (locally). 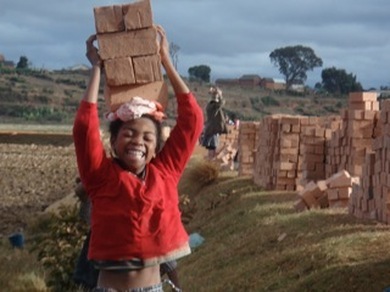 Bricks are made in the rice fields and baked in a brick oven for a week to make them strong and durable. Then everyone helps to carry them to the building site. Our school wells are dug by hand to provide water for gardens, lunches, cleaning and drinking. The well-digger digs deeper and deeper into the hole, while helpers pull up buckets of earth. This well is about 17 metres deep. When we have a construction crew working at our schools we take on young men as apprentices to work alongside them. 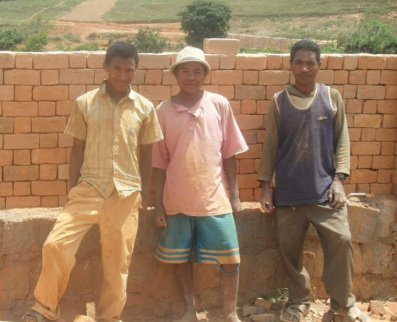 So far we have trained five apprentice builders, who now have full-time jobs. The first day at Lova Soa, our first school, with 65 children aged 4 to 6 years. Our local committee is the voice of the parents and community in ideas about further growth, and helps to manage the gardens. 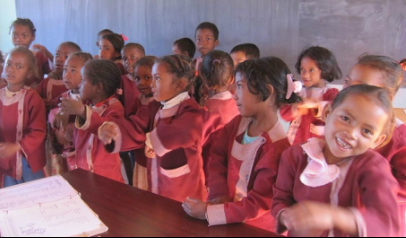 In addition, in the capital city we have a well-educated group of volunteers who manage our banking and counsel us about Malagasy law and customs. 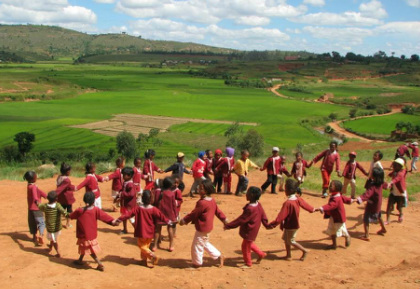 Our Malagasy administrator, school principals and teachers work together to run the project under Canadian supervision by email. 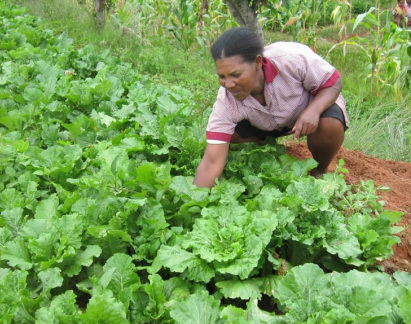 We started with 19 teenage girls in our villages who, at just 11 or 12, were leading the life of adults: caring for younger siblings or working in the fields and households. We now have 16 high school classes and 270 male and female students working towards high school graduation. We've launched trades classes to provide meaningful skills and work for the many young adults who have not had access to education or training. They're producing uniforms and beanbags for the schools, as well as embroidered and knitted items. The carpentry class makes shelves, storage units and desks for our schools, and furniture for sale. 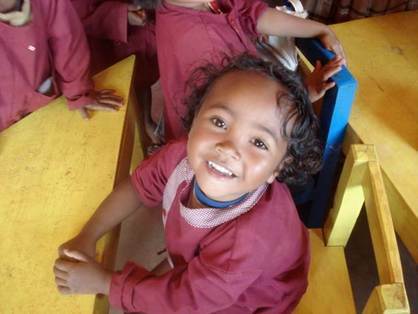 We employ four Malagasy cooks who work in the kitchen during the school day to prepare the meals for the children. 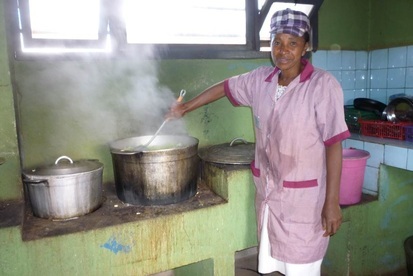 Our students are provided with a hot meal of rice and vegetables, in large portions, during the school day. In the Hungry Time this may be their only meal of the day. The students who are identified by our doctor as severely malnourished come to school for breakfast too. While their parents are working in the fields, our students bring their younger siblings to the school for a protein pablum every day. 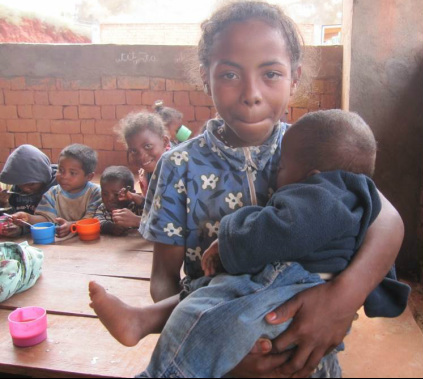 Many children in central Madagascar are small because of malnutrition. Our doctor has noticed a big difference in the children's growth since we began to feed them all year round, rather than only in the Hungry Time. 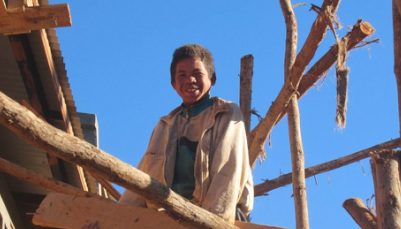 Despite their difficult living conditions, the Malagasy are happy people with strong family bonds and a willingness to work together in community. Most of all, the rural people want an education for their children. We're helping to make that happen. Changing lives, and the future.